The University of Wisconsin-Milwaukee asked three things of the Cambridge Commons design: that it would provide space for 500-700 students, that it would provide living/learning opportunities with classrooms and academic support space, and that it would leverage UWM’s renewable energy initiatives while providing educational and research opportunities through green building design. 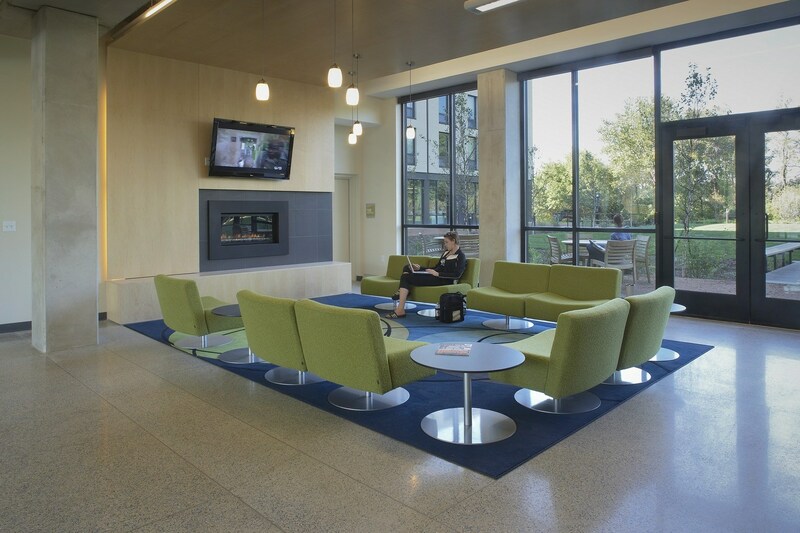 HGA met these requirements with a 700-student, LEED Gold Certified residence hall with classrooms, administration offices, a workout room, lounges and laundry facilities. 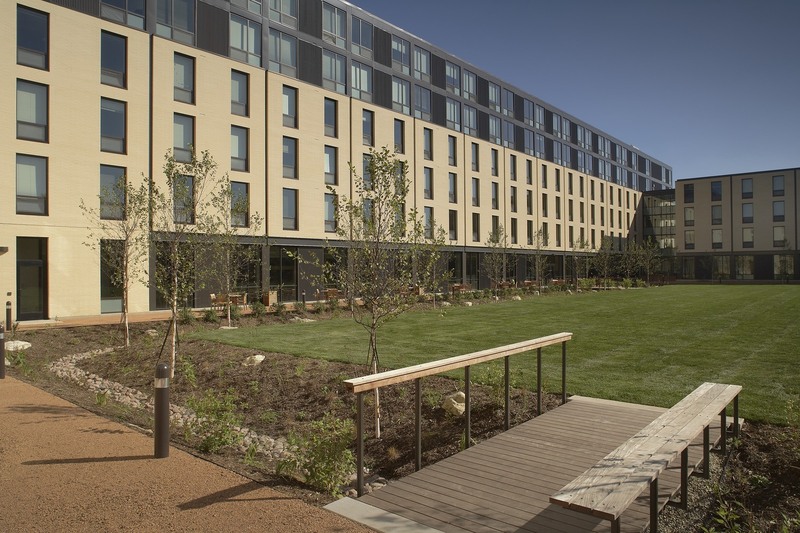 The residence hall design takes advantage of its prominent urban edge location by placing retail space along the sidewalk for a convenience store. 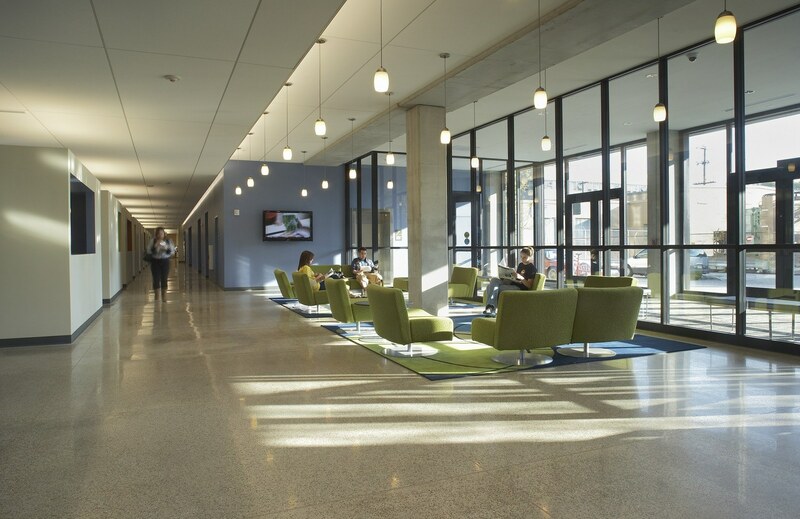 requirements of LEED certification with the evolving demands of the University’s students. 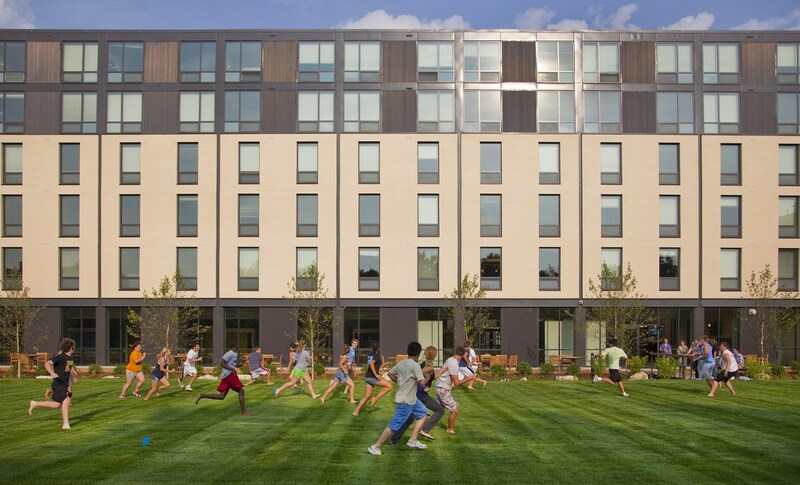 Cambridge Commons is made up of three distinct buildings arranged to form a courtyard facing the river that enhances student life with outdoor dining, recreation and green playing field spaces. Freshmen students live in suites divided into two double-bed rooms with a shared bath. Sophomores live in apartment-style units with a shared living/dining/ kitchen space. 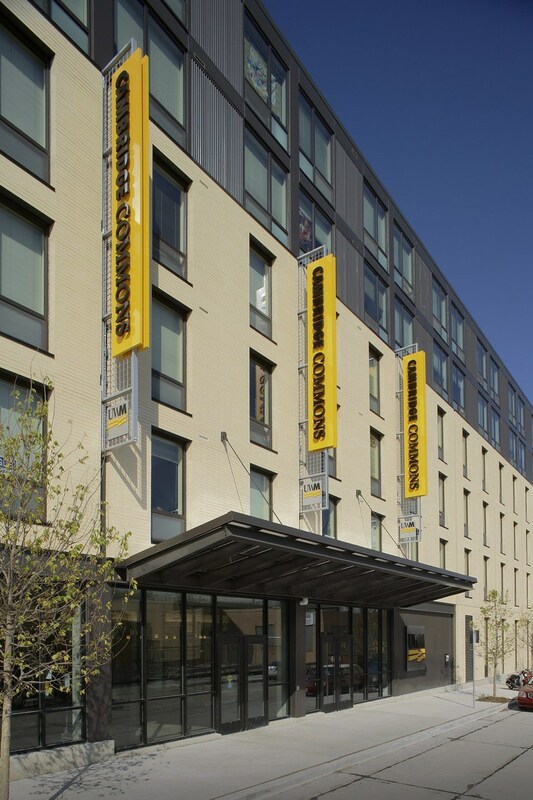 Cambridge Commons is located in a busy urban neighborhood overlooking the Milwaukee River bluffs. 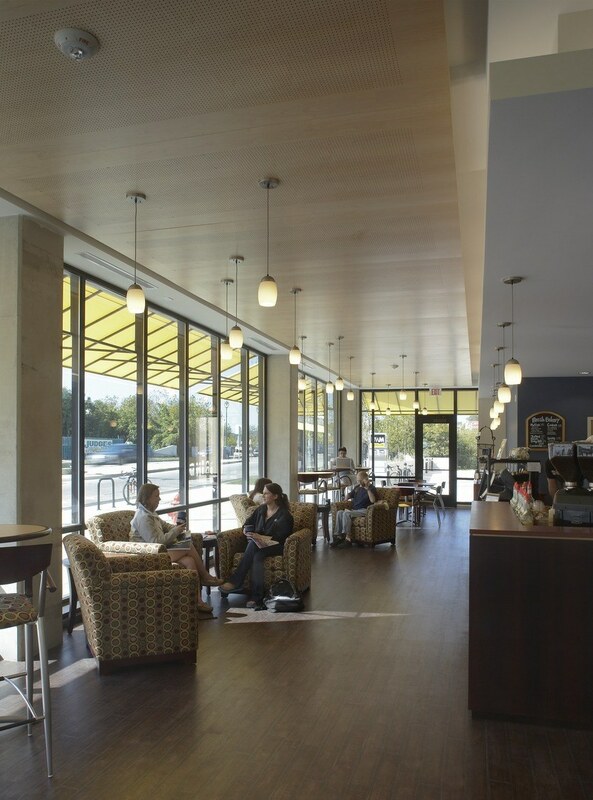 With its river-front location, water quality emerged as a major design consideration for Cambridge Commons, both for environmental reasons and as an opportunity to meet the University’s goal of providing educational and research opportunities in green building design. Green roofs on the lower levels absorb rain water while the upper roofs redirect rain water into an 18,000-gallon underground cistern for irrigation. Porous pavements and extensive rain gardens with native plantings clean and filter storm water, preventing it from eroding the bluff, and treating it before it gets to the Milwaukee River. 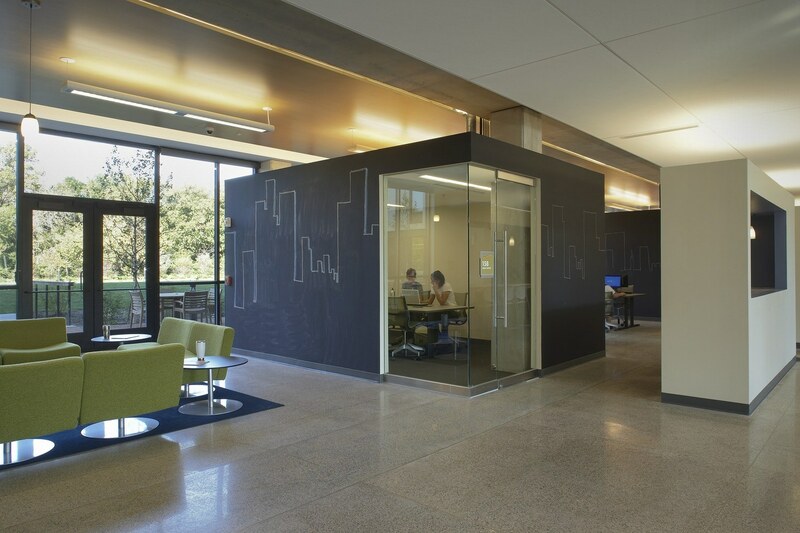 The design also included technology “dashboards” on each floor that show residents their energy usage in real time. Energy usage was substantially reduced through a number of efforts, such as automated temperature control, solar energy generation and smartly designed HVAC systems. Overall energy use fell 26.4 percent below code, and the building achieved “Designed to meet Energy Star” designation with a score of 85.